Five mares and two filly foals had been at summer pasture for more than two months, and it was time for them to come home. With just a three-stall trailer, it meant three trips back and forth, taking all of one morning plus part of the afternoon when I made one last trip to fetch the temporary fencing. As I made one trip and then another, I pondered the good news and the bad news of this transition. The bad news is that the ponies no longer roam over tens of acres at will in search of food; the good news is that they roamed for a good part of the summer over tens of acres being ponies. The bad news is that there are now more mouths to feed four times a day. The good news is I’m no longer on the highway at dusk when distracted hunters are making the roads dangerous. The bad news is that the ponies are now here where they want attention every time they see me. The good news is that they want attention every time they see me, even the little girls! The bad news was that the little girls hadn’t loaded into a trailer in more than two months, and the good news is that they loaded like they’d just done it the day before! The good news is that my stud colt Asi seemed excited to see the girls when they returned. 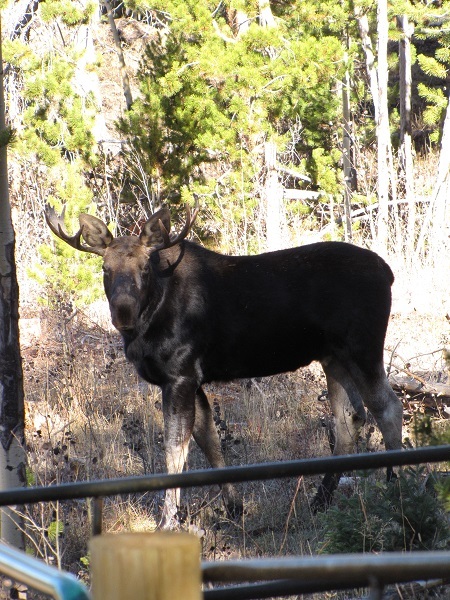 The bad news is that he wasn’t the only young male interested; there was a bull moose hanging about, too! The good news is that now the girls are here where I can see them more often than I did all summer. They seem to like that, too. 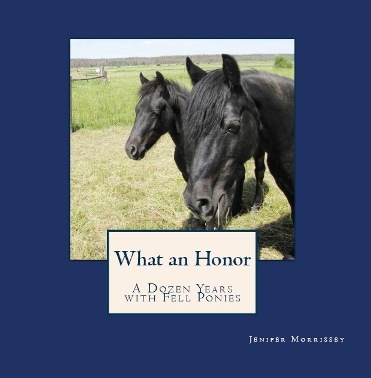 Life with ponies is very much a good news story! Lots of stories like this one can be found in the book What an Honor, available internationally by clicking here or on the book cover. As the fall equinox approaches, darkness is nearing my last feeding of the day, so I’m contemplating lighting assistance. I’ve always had solar lights at the pony paddocks, and I’ve relied on my good night vision to navigate between paddocks. That’s especially easy on moonlit nights or when there’s snow on the ground (plus our sole security light that cuts the darkness in many places). On those rare occasions when my husband goes out to feed with me, he wears a headlight or uses a flashlight, and my eyes have a hard time adjusting to that light and then the darkness and then back again. Many of the solar lights at the pony paddocks need to be replaced, as is normal every few years. I have been using path lights that I mount over the gates to my hay yards because they are economical and shine broadly but not necessarily brightly. My husband has been advocating for lights mounted elsewhere because often when we move the gates when stacking hay, the lights fall off the gates and break. Most of the other solar lights I’ve looked at that could be mounted on the pony sheds are more expensive and are motion-sensitive. I’ve been hesitant to go that route. I’ve also considered just using a headlamp, but my experience when with my husband has made me hesitant to use that solution either. To this point, then, I haven’t replaced my lights because a) I haven’t needed to with the long days, and b) I haven’t landed on a solution that felt right. I’ve just learned something about equine eyesight that is helping me finally make the decision I need to make about lighting at last feeding (and some morning feedings in the dead of winter). (1) Our human eyes adapt from light to dark in a matter of minutes. We all know it isn’t instantaneous; we’ve walked from sunshine into a dark barn and can’t see, or out of the house into bright sunshine and have to shield our eyes from the glare. Nonetheless, our eyes do adapt relatively quickly. It turns out that equine eyes take nearly a half hour to adapt to changes in lighting. They obviously can get along quite well as the sun makes its daily round because the transition from sunlight to twilight to dusk to dark for instance takes enough time that their eyes can adjust. I do wonder, though, how the copious forelocks of some Fells might make eye adjustment to changing light even more interesting. For instance, does lifting my stallion’s forelock to expose his eye mean he can’t see well because of the sudden change in light? Interesting food for thought! Applying this new information to my lighting problem, I’ve decided that motion-sensitive lights aren’t a good solution because the ponies’ eyes would take significant time to adjust to the sudden light, possibly many times during the night as the motion detector was triggered by moving ponies or wildlife. Similarly, a headlamp or flashlight will disrupt their eyesight for a significant period after I would appear. The lights I have been using are on all night (batteries willing), so the constant light is likely easier for the ponies to deal with since there isn’t an abrupt transition. So I’ll go back to the solution that’s been working for several years and try to remember to take the lights down whenever my husband needs to move the gate they’re attached to. Glad that decision is made! 1) Eyesight chapter in Williams, Wendy. The Horse: The Epic History of Our Noble Companion. New York: Scientific American/Farrar, Straus & Giroux, 2015.